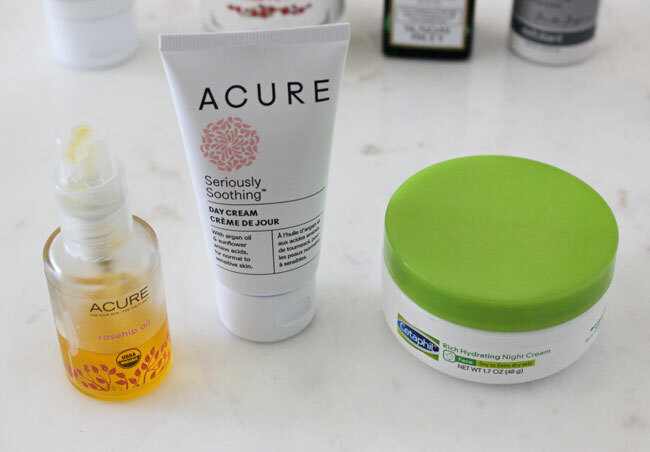 One of my most frequently asked questions is what products I use in my skincare routine. Not only do my readers ask often, but I've even had random people at parties make me write down everything I put on my face for them. None of these products are sponsored, these are all products I buy and use regularly. And I'm not linking you to a $300 miracle serum; the majority of these products are under $20 and only one is over $50. 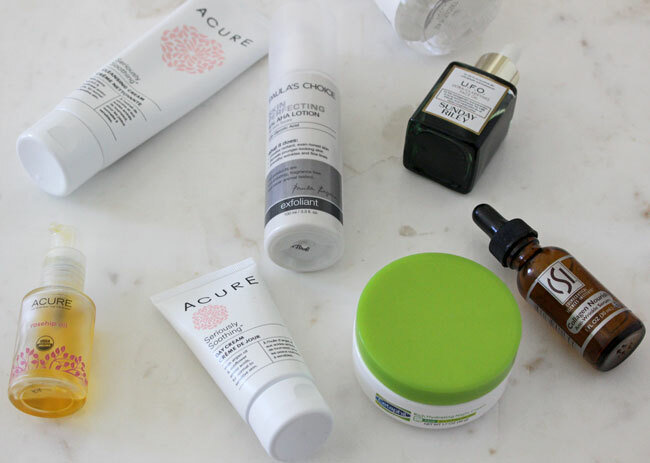 I've tried everything from high-end products to drugstore products to all natural products and this has been what's worked the best for my skin. I've never had really horrible acne maybe just a small breakout here and there but when I went off the pill it wreaked havoc on my skin and I was constantly breaking out. However, I have finally found a routine that works keeps my skin hydrated, glowing, and breakout free. I know everybody's skin is different and what works for one person doesn't always work for everyone, which can be really frustrating but I hope someone finds this helpful. Let me know if you use any of these products or if you have any questions down in the comments! 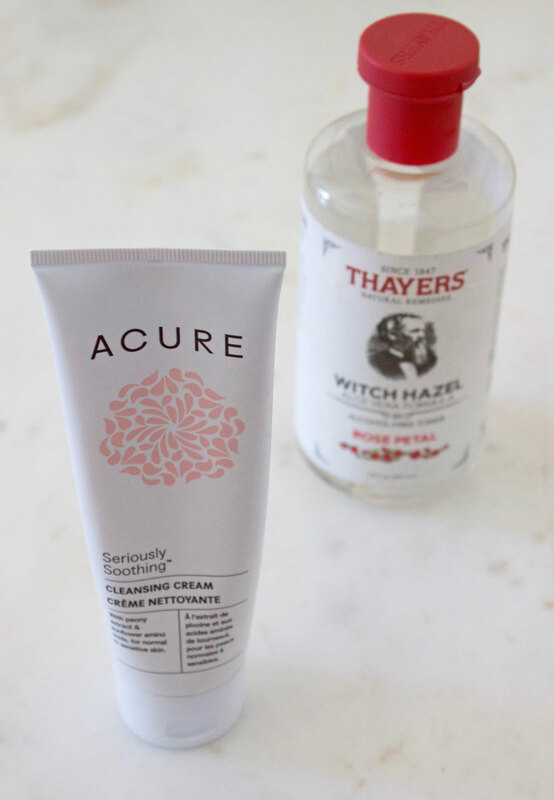 Acure Seriously Soothing Cleansing Cream // I use this cleanser morning and night. It's creamy and gentle so it leaves your face feeling clean without stripping it. It foams up nicely without any harsh ingredients, and it's under $10. Thayers Rose Petal Witch Hazel // This toner is packed with antioxidants and natural antibacterials. It fights inflammation and redness, balances your skin, and helps moisturize. It also smells great! Sunday Riley U.F.O. // This is the most expensive product on the list but it's loaded with ingredients that help clear your pores, calm and nourish your skin, and brighten dark spots. I definitely notice a difference when I use this and then stop. 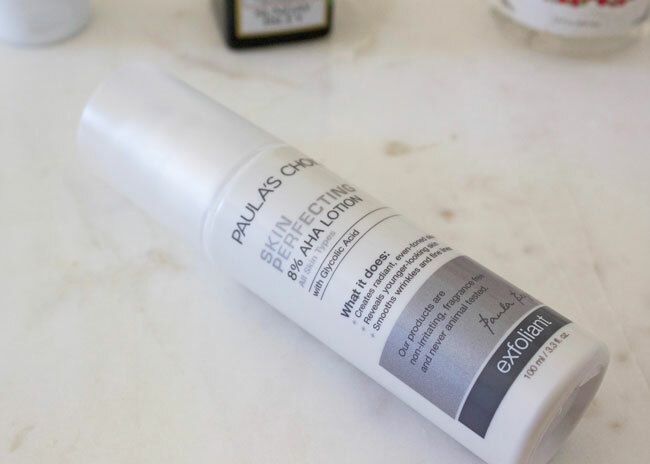 Paula's Choice Skin Perfecting 8% AHA Lotion // If you only try one product on my list, this is the one you should try. It's had the biggest impact on my skin. Since I started using this I haven't had a breakout and the overall tone and texture of my skin has improved. I think this product works way better than Good Genes for my skin and it's literally 10x cheaper. 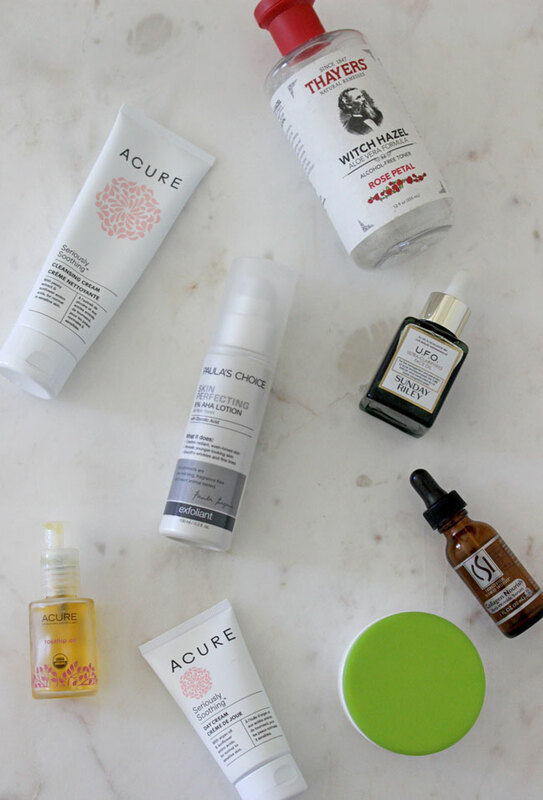 Acure Rosehip Oil // Rosehip is one of my favorite oils to put on my face. It absorbs quickly and doesn't clog your pores. It's also loaded with fatty acids that give your skin that natural glow everyone is trying to achieve with highlighter. I usually use this as a serum in the morning. 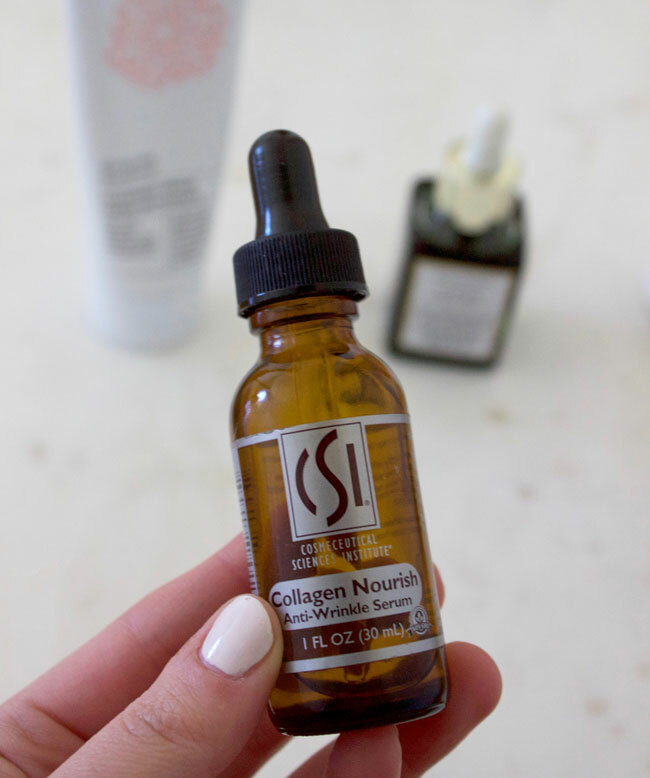 CSI Collagen Nourish Anti-Wrinkle Serum // This serum contains peptides that help stimulate your collagen production and hyaluronic acid to hydrate. Oh, and it's under $15. I use it every night. Acure Seriously Soothing Day Cream // This is a fantastic moisturizer for people with sensitive skin. I usually use it in the morning as my last step before I apply SPF. Cetaphil Rich Hydrating Night Cream // I have combination skin that gets dry and flakey in certain areas, especially in the colder, drier months. This is the only cream that moisturizes my skin thoroughly and keeps that from happening without leaving my skin greasy. Acure Brilliantly Brightening Facial Scrub // I use this a couple of times a week. It's all natural and not overly harsh. My skin always feels extra soft afterward. Aztec Secret Indian Healing Clay // I mix up a mask with this clay and apple cider vinegar and use it about twice a week. This is super affordable and really helps clear out your pores. Your pores will look a lot smaller and your face will feel so smooth after you use it. It can be a bit drying so if you have drier skin this may not be the best product for you. Acure Pore Clarifying Red Clay Mask // If your skin is a bit drier this might be the clay mask for you. It helps clear out your pores but it's also really moisturizing. I use this when my pores need a deep clean but my skin is feeling less hydrated than usual. That's pretty much it! I do use sheet masks but I don't really have any brand loyalty there. In addition to these topical products I take a fish/flax oil combination supplement and do one scoop of collagen powder in a cup of tea every day. 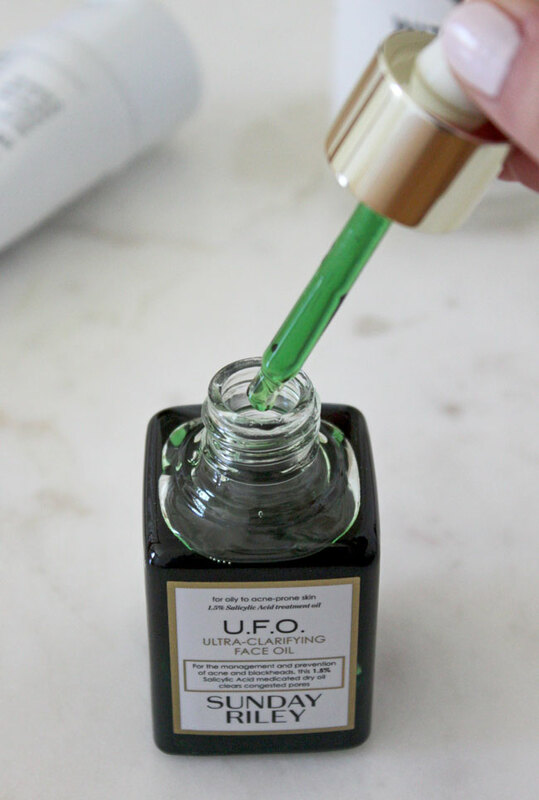 Also, I am in the market for a new eye cream so if you have any recommendations let me know! I love witch hazel. My mom introduced me to it a long time ago because she couldn't use traditional facial cleaners. I still use it to this day.